(7:30 a.m. EDT) -- Say goodbye to Carnival Triumph. A nearly $200 million makeover in spring 2019 will transform the ship into Carnival Sunrise -- adding the line's latest restaurants, bars and entertainment options, while redesigning everything from the cabins to the adults-only sun deck. Carnival Triumph will go under the knife on March 1, 2019, in Cadiz, Spain, where the 2,758-passenger ship will spend two months in dry dock. It then will be officially renamed Carnival Sunrise at a ceremony in late April, and join the line's Sunshine class. Carnival Sunshine, formerly Carnival Destiny, underwent a similar transformation in 2013 and eventually was placed in its own Sunshine class of ships. Carnival Triumph originally debuted in 1999 as a sister ship to Destiny; the vessel will be 20 years old by the time it goes through dry dock. "We're going to treat Carnival Sunrise like a new ship when it comes back into service, because it's going to be a new ship," Carnival spokesperson Vance Gulliksen told Cruise Critic. He added that this isn't just another routine dry dock. "We're redoing this to keep this ship long-term and to bring it up to the standards of our newer ships." Standout features on Carnival Sunrise will be new cabin categories and redesigned cabins as well as the addition of several new bars and eateries, including Guy's Pig & Anchor Bar-B-Que Smokehouse (developed by Food Network star, chef Guy Fieri) and Cucina del Capitano, both of which are found only on Carnival's newest ships. "These new dining spaces and features complement many of Carnival's signature food and beverage outlets that were added during previous renovations, including Guy's Burger Joint, developed in tandem with Guy Fieri," said Carnival's chief operating officer, Gus Antorcha. "Carnival's investments are part of an overall plan that is raising the bar on ship amenities and features, itineraries and offshore excursions that our guests are loving." Carnival staples that were added during the ship's last refurbishment -- such as Guy's Burger Joint, BlueIguana Cantina and Alchemy Bar -- will remain onboard. New Cabin Categories: Carnival Sunrise will offer more choices, when it comes to selecting a room, with the addition of several spa cabins as well as two Captain's Suites. Cloud 9 Spa cabins -- which are available on other ships as inside, oceanview, balcony and suite categories -- provide occupants with free access to the thermal suite, two free fitness classes (per passenger), higher quality toiletries and upgraded bathrobes and slippers. Other new accommodation options will include two Junior Suites and two Captain's Suites, adjacent to the bridge. Redesigned Cabins: All of the ship's cabins will be refreshed with new furnishings and a Caribbean-inspired color scheme of bright colors and soft pastels. Guy's Pig & Anchor Bar-B-Que Smokehouse: Also backed by Guy Fieri, this casual lunch joint serves smoked meats and savory sides in an open-air setting -- all free of charge. It will be located on Carnival Sunrise's upper Lido Deck. Cucina del Capitano: This Italian trattoria-style venue offers a complimentary lunch as well as dinner for a flat fee of only $15. Lunch features a make-your-own pasta bar, while the dinner menu includes a variety of Italian classics. Fahrenheit 555 Steakhouse: Perfect for celebrating special occasions, the steakhouse will serve traditional steakhouse dishes in an upscale environment. The cost is $35 for adults and $10 for children 11 and under. Bonsai Sushi Express: This offshoot of the line's popular sushi restaurant, Bonsai Sushi, serves made-to-order, a la carte sushi, sashimi and more for lunch and dinner. RedFrog Pub: Carnival's much-loved RedFrog Pub is a hub for bar games like beer pong and corn hole (beanbag toss). The hangout spot offers Caribbean-themed bites (about $2 to $3 a piece), while its bar has an emphasis on beer -- including the line's private label. Serenity Deck: The ship has long been one of the few in the fleet without the line's adults-only Serenity sun deck; now it will boast a sweeping space where passengers 21 and over can relax in clamshell loungers, hammocks and hot tubs while enjoying bar service. Carnival's Serenity Deck is one of the only adults-only sun decks at sea that does not bear a surcharge. Cloud 9 Spa & Fitness Center: Health and wellness-minded cruises will enjoy a new and improved spa, with a thermal suite and private treatment rooms, as well as new cardio and weight-training equipment in the fitness center. Outdoor Recreation: The ship will receive Carnival's SportSquare, a complex that consists of a ropes course, sports courts and mini-golf course. Furthermore, two water slides as well as a kids' splash area will be added. Kids' Clubs: Adopting the Camp Ocean layout found on other ships, the kids' clubs will boast a marine theme and a variety of new activities. Other updates include Java Blue Cafe, a specialty coffee venue that will replace Cafe Vienna; a new Chef's Table space; the addition of Carnival's Cherry on Top candy shop; an overhaul of the buffet, which will offer new stations such as Pizzeria del Capitano and the New England-inspired Seafood Shack; redesigned entertainment venues, including a new main theater, piano bar and comedy club; and an updated arcade. As Cruise Critic also reported in January 2018, the ship will begin offering cruises from Norfolk, Va. and New York after its refurbishment, though minor adjustments to the itineraries have been made since the first announcement. Gulliksen told Cruise Critic the time required for the refurbishment was already set aside, and any booked cruisers who might have been affected were notified when it was first revealed in January 2018. 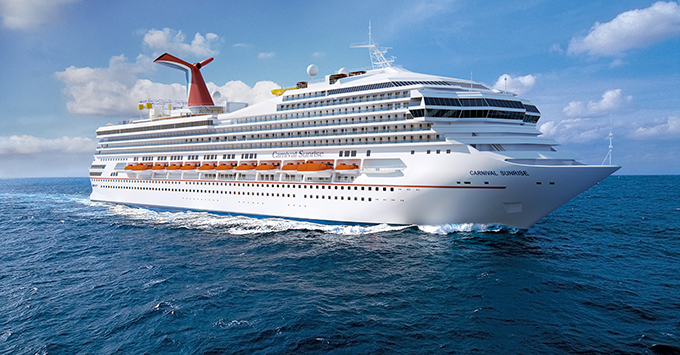 Carnival Sunrise's first cruise will kick off on April 29, from Norfolk. It will offer a series of five- and seven-night Bahamas and Caribbean cruises before repositioning to New York for the summer -- where it will operate four- to 14-night cruises to Bermuda, the Caribbean and Canada & New England. The longer itineraries will visit more exotic ports; one 12-night cruise will include a Panama Canal transit as well as a variety of enrichment activities. In October, the ship will head to its new homeport of Fort Lauderdale to sail four- and five-night Bahamas and Caribbean cruises. Port highlights include Havana, Cuba, as well as private islands in the Bahamas operated by Carnival's sister brands: Half Moon Cay (Holland America) and Princess Cays (Princess Cruises). "[Carnival Sunrise's itineraries] are part of our 'close to home' deployment strategy that allows people to drive to the port," Gulliksen added. Carnival's move follows a trend of cruise lines injecting new life into old ships, beyond routine maintenance. Other recent examples include Royal Caribbean's "Royal Amplified" program, a $900 investment that will go toward overhauling the line's older ships, as well as Celebrity Cruises' "Celebrity Revolution" program, a $500 million initiative that involves modernizing the line's Millennium class of ships.